Marantz PM6006 UK Edition (2018) review | What Hi-Fi? What Hi-Fi? Awards 2018 winner. 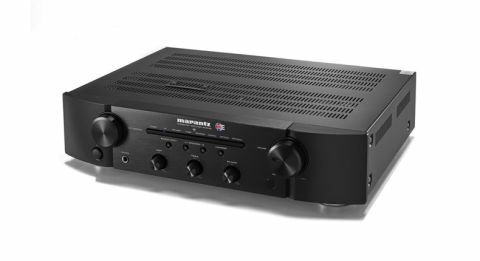 Marantz makes small, but telling, improvements to a class-leading amplifier. What makes for a UK Edition of an already beloved integrated amplifier? Is it one whose timbre better matches the complex taste of a bacon butty? Is it easy-wipe to cope with the damp, drizzly weather? Or perhaps it is portable, designed for those afterschool trips to the park with a can of cider? In fact, it’s a lot more sensible than that. While Marantz has kept the details of the changes made to its Award-winning PM6006 amplifier close to its chest, it has taken the opportunity to fine-tune its operation with help from some of the finest technicians in the industry. This opportunity may have arisen organically. As time goes by, certain parts become unavailable, and ploughing the same furrow with different tools is not always the most fruitful of practices. So is this a replacement for the original PM6006? As far as the consumer is concerned: probably not. Upturns in quality between different versions of the same product are usually not drastic enough to consider discarding an older-but-class-leading piece of kit completely. But, all being well, what it does mean is that anybody entering the market now will be treated to even better value for money than before. And that’s where we are at with the PM6006. Even with the two side-by-side, we'd hesitate to give percentage-point improvements - but with an amp that’s become like an old friend over the past couple of years, we can confidently say this is even more obviously a five-star product than its predecessor. Despite internal changes, outwardly the UK Edition looks identical to the original (apart from some additional branding). The front face is dominated by a pair of dials – one for toggling input and one for managing volume – flanking a slim-line LED source indicator. Below the latter is a quartet of buttons for switching between the amp’s internal DAC and analogue inputs, between either or both pairs of wireable speakers, and to operate the PM6006’s ‘loudness’ feature. Further down is another trio of smaller dials for fine-tuning bass, treble and balance, and also a 6.3mm headphone jack. On the back panel, you’ll find five analogue line-ins, a coaxial and two optical digital inputs, outputs accommodating two pairs of speakers and a tape loop for recording. That means there’s still no USB input - Marantz says to include one would be impossible at the price point, and to look further up the chain if that is indeed a deal-breaker. So if you own the original PM6006, there’s no need to trade it in. But if you’re in the market for a stereo amp, then this is just about the finest performance you’ll get in return for this amount of money. It’s a characteristically full-bodied and focused Marantz presentation, with plenty of detail to boot. Maybe the most granular textures aren’t so readily on offer - this amp favours a smoother and more wholesome overall tone - but there’s more than enough to dig into without becoming overly analytical or losing any sense of musicality. And musicality is one of the PM6006’s strengths. The balance is tonally even and overall it’s pleasingly insightful, with a nice wide soundstage - but even more so it’s rhythmically and dynamically confident, knitting together instruments in a manner that highlights this as a budget-to-midrange gem. There’s a certain smoothness between strands, yet also enough punch and drive to grab attention, with the Marantz’s keen sense of timing accented by a dynamic range sympathetic to leading notes and auxiliary rhythms. These aspects can, of course, be improved upon if you’re willing to pay, as with any other facet of performance - but the PM6006’s talents are such that it will musically trump many amps much further up the food chain. The built-in DAC is a decent performer that retains much of the detail we hear through the line stage, but loses a bit of body and natural warmth on the way.